With Timecode, 8-track, 4-microphone preamplifiers, the Nagra VI is a go-to solution for films and documentaries. 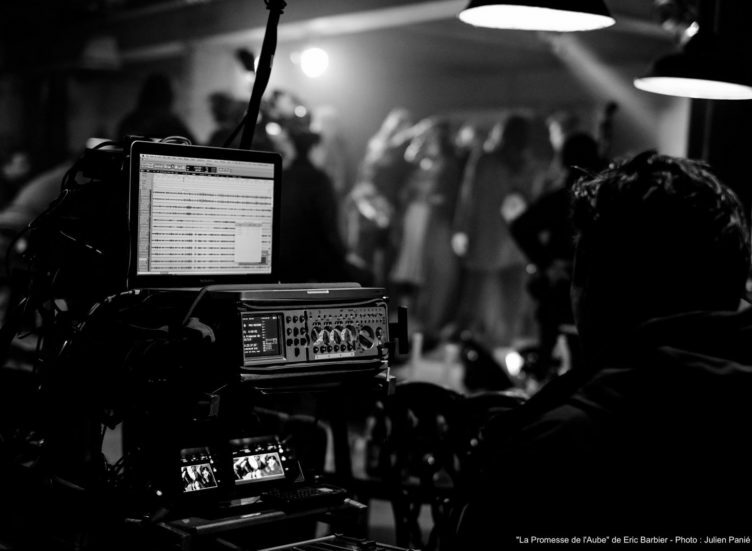 It is easy and intuitive to operate, allowing sound engineers to focus on sound. 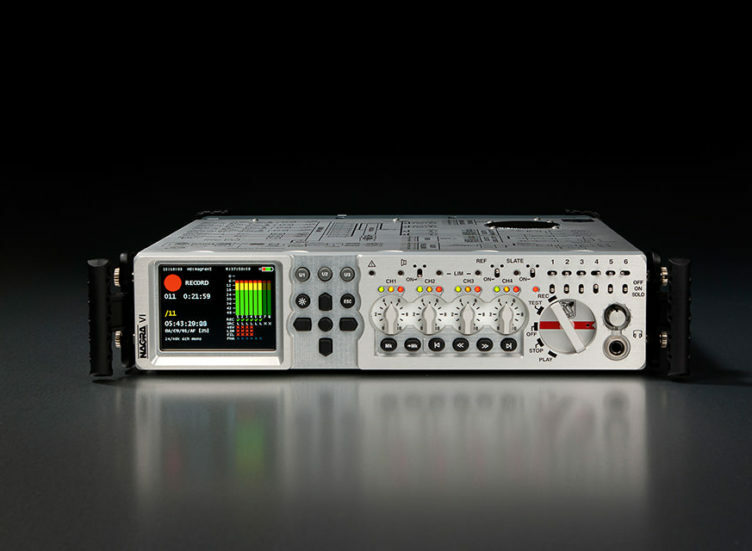 The Nagra VI is an 8-channel digital recorder, offering 24 bit wordlength and sampling frequencies from 32 kHz up to 192 kHz. 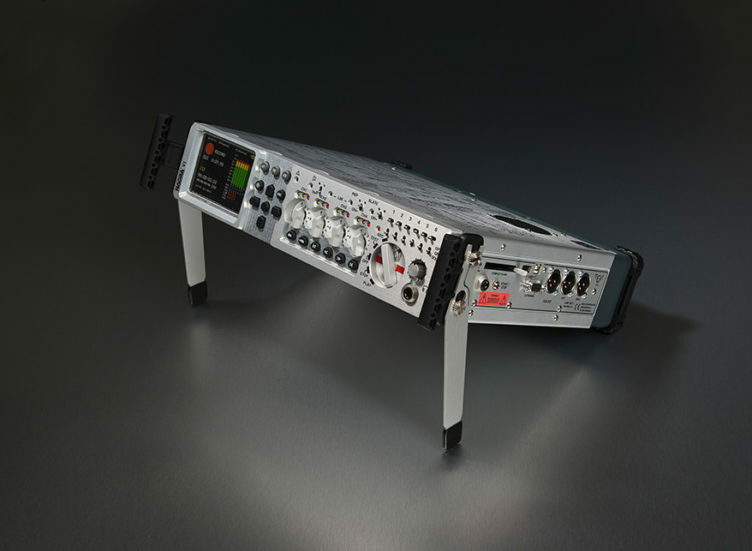 There are 6 analog inputs, 4 of which are equipped with high-quality Nagra microphone preamplifiers and 2 AES inputs. 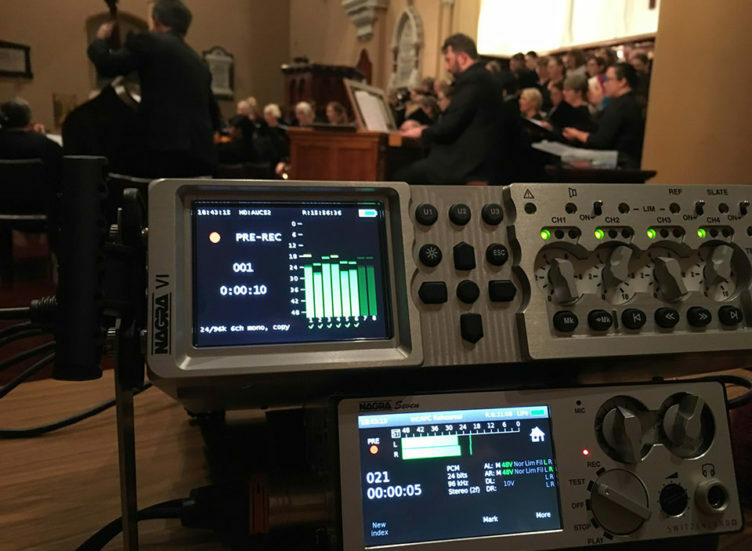 Equipped as standard with a full SMPTE/EBU time code sytem including a chase synchronizer, iXML metadata, programmable digital filters and monitoring for Ambisonic microphones. 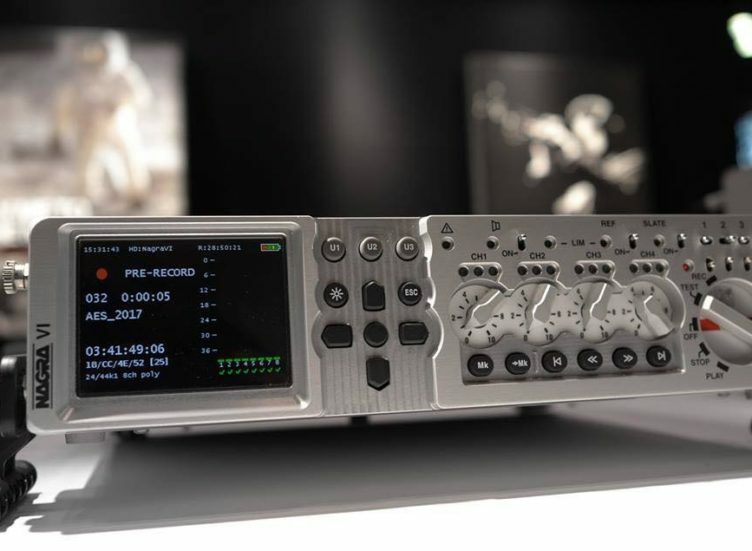 The Nagra VI digital audio recorder was awarded the TEC Award for “Outstanding Technical Achievement” at a ceremony in New York on Saturday October 10th 2009 during the 127th AES show. The Nagra VI uses a design concept where the hardware is software dependent and can be adapted simply through firmware programming. The principal recording media is an 120GB internal hard disk, which can be replaced with an SSD if desired. Removable Compact Flash cards serve as the removable media. All main functions are located on the front panel of the recorder, and all set-up features are accesses through ergonomic menus and shown on the 3.5″ TFT sunlight-readable display. The Nagra VI is fitted with an interchangeable lithium-ion battery pack, and supplied with a mains power supply for charging. Available with a machined aluminium front panel, or in a choice of three plastic fronted colors (“Slate” grey, “Midnight” blue and “Burgundy” red) and is supplied with two plastic handles which also serve to protect the front of the unit from accidental damage. A carrying case and strap for over-the-shoulder operation and a pair of legs to incline the recorder for easier table-top operation are also supplied. It offers six independent analog audio inputs. Inputs 1 – 4 are equipped with traditional Nagra microphone preamplifiers for dynamic and phantom +48V microphones and menu selectable sensitivity for different microphone types. These preamplifiers are a combination of those developed for the Nagra V and Nagra-D. An audio limiter can be selected for each of the microphone inputs and can be ganged in pairs if desired. The four “In-house” transformers offer fully floating inputs for the dynamic microphones, giving a greatly improved signal-to-noise ratio. The remaining two analog inputs are LINE level for connection to other equipment supplying a line level signal, such as radio receivers. When set to the LINE position all 6 analogue inputs will accept up to +24dB. The two input connections (channels 5 + 6) double up as AES inputs (A and B) when selected to digital input mode. A total of 8 channels can be recorded; 6 audio inputs + a two channel mix, or 8 inputs assuming both AES inputs are used for 4 digital inputs. The Nagra VI does not use traditional logarithmic potentiometers for the audio levels as were traditionally used on previous Nagra models. Today digital “encoders” are preferable because they do not suffer from “crackling” noise problems, and can be programmed to fulfill a multitude of different operations depending on the software program controlling them. Equally, even the graduation of the sweep is software calculated and can be altered relatively easily, rather than being created by the precision winding of the internal coils during manufacturing. However, such encoders often suffer from a phenomena known as the “Zipper” noise. 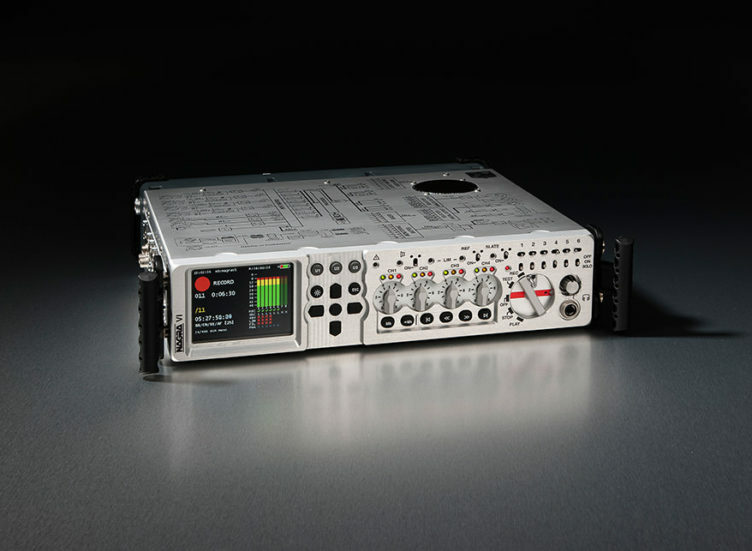 The NAGRA VI benefits from a complex development in a suppression system used on every level control of the recorder. The end-result is that the potentiometers can be moved instantaneously and no digital zipper effect can be heard. The potentiometers on the Nagra VI behave in exactly the same manner as the traditional logarithmic potentiometers used in Nagra analog recorders but with the advantage of the precision offered by digitally controlled encoder devices, and hence an increase the perfection of all recordings. The left side panel clearly shows not only the analogue and digital audio input connections, but also the external 4 pole XLR DC input socket, allowing the NAGRA VI to be externally powered from an external DC power source such as a car battery. The 5-pin LEMO SMPTE/EBU time code In/Out can also be seen as well as the two HIROSE connectors used for powering external accessories such as radio receivers. These two connectors can supply up to 1 A at 12V. The right side of the recorder is where the removable compact flash card is located. A LED next to the slot indicates when the card is accessed. The stereo analogue outputs, and the main AES out as well as the second headphone connector can be clearly seen. Additional AES outputs are located on the 15 pin Extension connector. The Start / Stop terminal is a fader start (contact closure) command as found on other Nagra recorders. Two USB (host / device) connectors are also located on the right side next to the card slot. The host connector allows the connection of an external USB drive (USB keyboard, USB key drive, external hard drive or DVD-RAM burner) and the slave connector allows the Nagra VI to appear as an additional drive(s) on a PC or MAC. An optional second USB port is available (as shown on the photograph above) allowing both an external USB drive AND a keyboard to be connected simultaneously, but this should be specified when ordering. 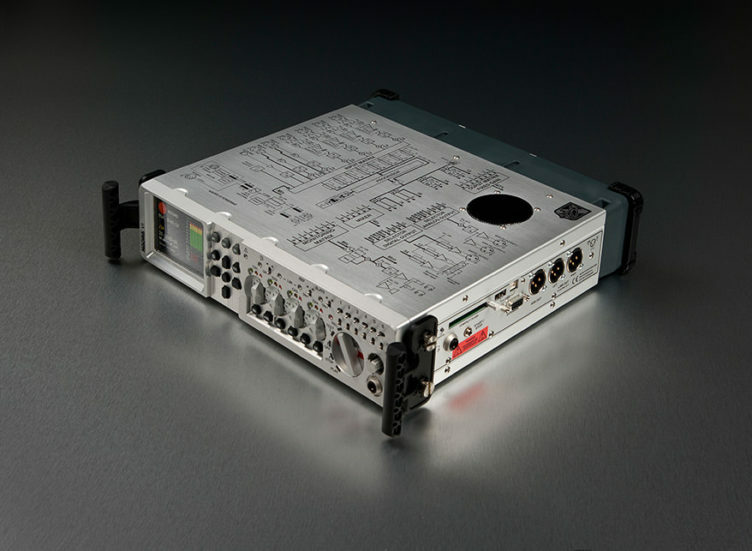 The Nagra VI records to a 120GB internal 2.5″ hard disk. An extractable compact Flash card is used to record a copy of the audio tracks depending on the users track selections. The Nagra VI allows approximately 15 minutes of 8-track 48 kHz 24-bit recording per GB of available disk / card space. The compact flash card section is equipped with a “Hot-Swap” possibility meaning that the CF card can be removed and replaced while the Nagra VI is powered up, without causing any damage to the card or the recorder. The Nagra VI records using Broadcast Wave File (BWF) format and is iXML compatible for the metadata making the files compatible with all modern post-production equipment. The Nagra VI is equipped with a sunlight-readable 3.5″ color TFT display with a resolution of 320 x 200 pixels. This specially designed high luminosity display is used to visually indicate not only the status of the Nagra VI but also the bargraph modulometers, take number, time code and the current operating modes of the machine. It is also used to display the menu system for all the machine parameters. When the display is in the menu mode, the audio levels can still be monitored using the LEDs on the front panel. A choice of user selectable screens can be displayed in the Test, Record and Play positions, including the modulometers ONLY, according to the operators desire. The colors and intensity of the screen can be adjusted by the user. The Nagra VI has the possibility to mix the audio from the 6 analog inputs to a stereo mix on channels 7 + 8 The output of the mixer can be set to both mono or stereo. Each microphone input level and L / R pan can be controlled using the arrow keys giving versatile mixing facilities. The mix channels can be recorded to the CF card in the copy process, as well as being recorded to the internal drive in the normal manner. If channels 7 + 8 are not being used for the mix, then all 8 inputs can be used for recording (using both digital inputs). 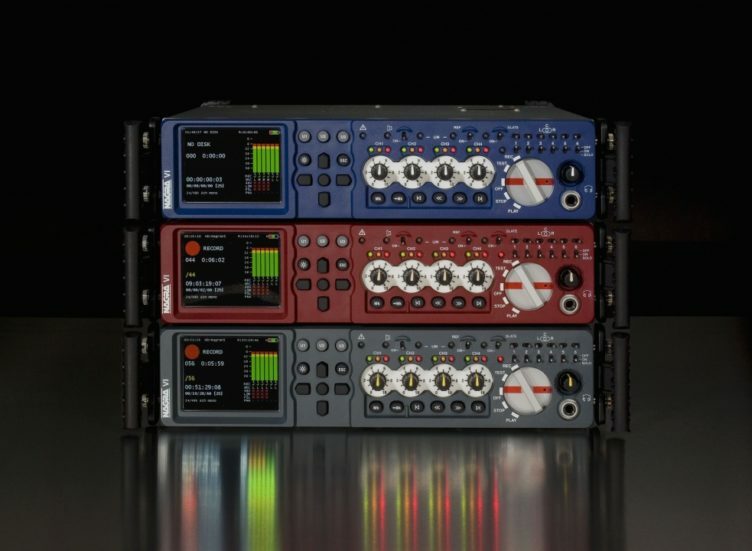 Mixing to the audio outputs during playback is also possible. The Nagra VI is equipped with a powerful routine to verify the read and write speed permitted by the different media (internal drive, CF card and USB drives). Certain “clone” or “fake” CF cards are available on the internet and the NAGRA VI allows the user not only to verify the digital id of the CF cards but also to check the read/write capacity of these media. Poor quality, low cost cards can cause severe problems when trying to write high bit rate linear PCM audio in real time. 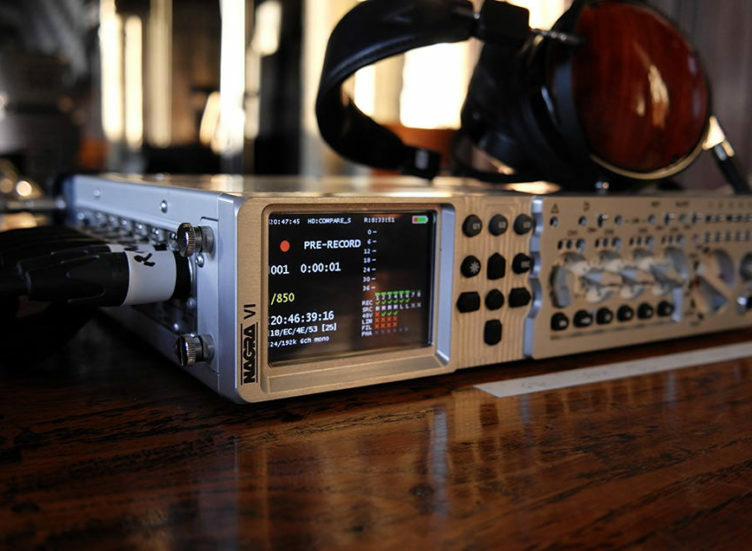 The Nagra VI is equipped with two high speed USB 2.0 ports. One is designed to connect the Nagra VI to a computer for file transfer. The second is a “host” connection and is used for connection of an external drive (USB key, external hard disk, DVD-RAM burner) or an external device such as a USB keyboard. The Nagra VI can store up to six internal templates containing all the user selectable settings and parameters of the recorder. These can be individually named and recalled at any time to rapidly change the settings of the machine depending on the desired operating situation. Templates may also be stored on an external media (6 per media) as text files and can be edited using a simple text editor such as Notepad. This system allows the creation and use of partial templates if desired. The internal time code system and all the internal digital electronics of the Nagra VI are clocked by a crystal which is a “Stratum III” TCXO which has been artificially aged in an oven to maintain stability. This crystal gives a guaranteed overall stability better than ±4.6ppm over a period of 15 years throughout a temperature range from -20°C to +70°C. The drift due to temperature changes is less than 0.28ppm. This is the most accurate crystal ever used in an NAGRA recorder. 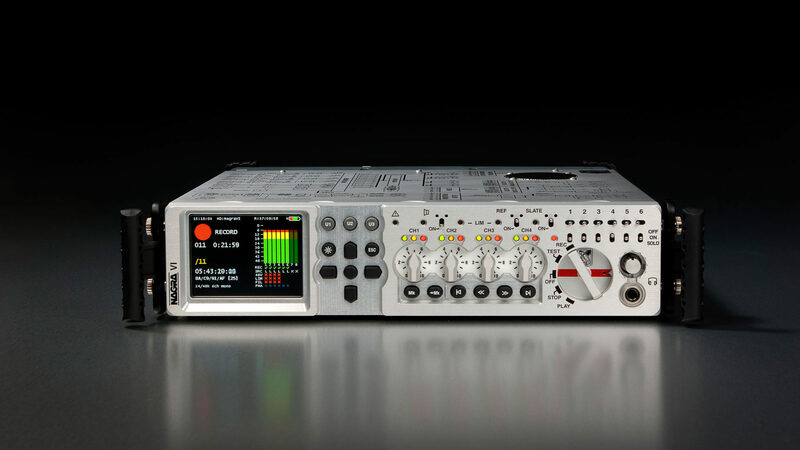 The Nagra VI will handle all the standard SMPTE / EBU frame rates as well as the 23.976fps rate for the HD format. All the frame rates can be pulled “up/down” for the NTSC markets. 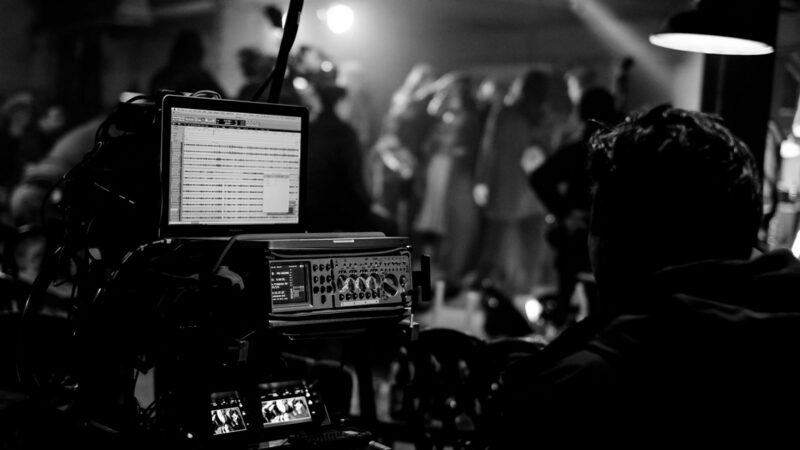 The internal chase synchronizer allows the recorder to follow / chase any external time code signal for post production synchronization purposes.